You do not have to play many rounds of golf to understand how much of the game is played in the mind. Different courses, conditions, and shot requirements all present unique challenges that need focus and mental strength from the winning player. In turn, moving from the practice range onto the golf course can often magically produce drops in concentration, increased frustration, and unexpected self-doubt: drives go wayward, three foot putts get missed, and water features seem to become magnets. The Successful Golfer is designed to help address 50 of the most common faults that players experience and which hold them back. These include: hitting the self-destruct button when winning, nervousness on the first tee, lost confidence, failing to practise as you play, losing focus off poor drives, and many more. Each fault is remedied with a clear practical fix. You will learn to develop effective practice plans, build a dependable pre-shot routine, cope with the pressures of competitive golf, and deal with distractions. In the second part of the book, lessons from 30 fascinating research studies on golf are presented to help keep you ahead of the field. They include research on putting, practice, choking, and overthinking. In the third and final part of the book, clear instructions are provided on developing a number of highly effective techniques that can be used across a wide variety of situations. These include: pre-shot routines, breathing exercises, goal setting, and how best to practice. Written by experienced Sport Psychologists, Dr. Paul McCarthy and Dr. Marc Jones, The Successful Golfer is a must-read addition to any golf psychology bookshelf. 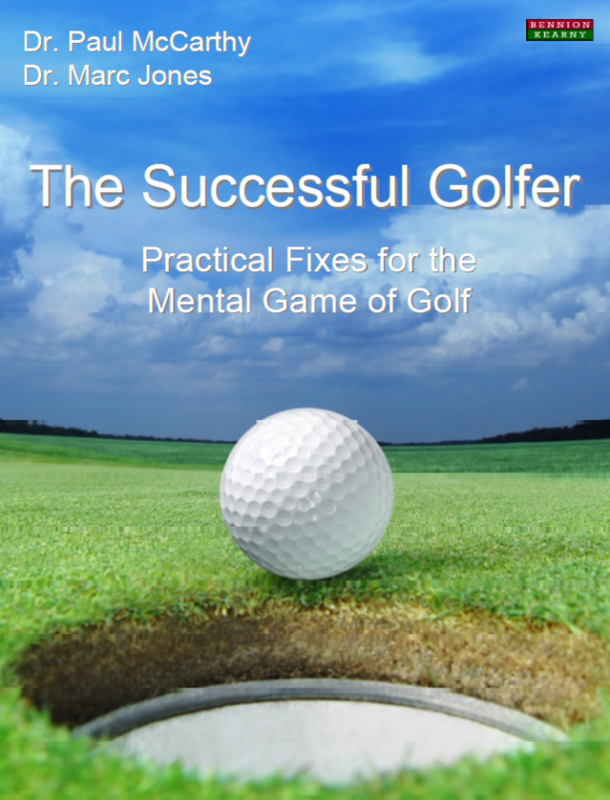 Read it and fix those mental faults that stop you from playing your best golf! Who this Book is for. This book is for both amateur and professional golfers seeking to conquer the mental side to the game of golf. All ages and levels of experience will benefit from the knowledge and advice contained within. Research Bunker #2: If you want to putt well don’t think about it! Research Bunker #3: Be careful what you think! Research Bunker #9: On what should you concentrate to hit more accurate shots in golf? Research Bunker #12: How quickly do golfers’ performances decline as they get older? Research Bunker #18: Why does Tiger Woods wear red? Research Bunker #22: Broken clubs and expletives – how do golfers cope with stress? Research Bunker #24: Is there such a thing as a “streaky” putter? Research Bunker #25: Which skills will earn you the most money in golf? Research Bunker #26: How much time should you take over your putts? Research Bunker #27: Do good PGA professionals play better when Tiger Woods is around? Research Bunker #28: Do you overthink your putts? And is it helping your putting? Research Bunker #29: Are professional golfers at the Masters getting better each year? Research Bunker #30: Should you play aggressively or conservatively for the best outcomes in golf? Dr Paul McCarthy is the first-ever resident Sport Psychologist at the home of golf – St Andrews Links – and a Lecturer in Psychology at Glasgow Caledonian University. He has published numerous academic papers and books in sport and exercise psychology. He is a registered Sport Psychologist (HCPC) with over 15 years of experience working as a consultant in amateur and professional golf. Dr Marc Jones is a Reader in Sport and Exercise Psychology at Staffordshire University and has published over forty academic papers mostly in the area of stress and emotion. He is a registered Sport Psychologist (HCPC) and is currently working as a consultant in professional football and golf.